Marx Brothers DVD Collection: 8 DVD's and 8 classic films. A Girl in Every Port/The Cocoanuts/Love Happy/Room Service/Animal Crackers/Monkey Business/Horse Feathers/Duck Soup DELIVERED FREE IN THE UK. 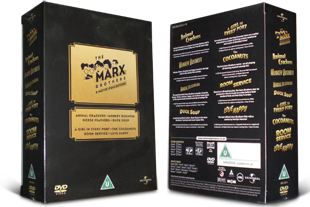 This six-disc collection of Marx Brothers' comedy classics includes: A Girl in Every Port/The Cocoanuts/Love Happy/Room Service/Animal Crackers/Monkey Business/Horse Feathers/Duck Soup. A great collection for any classic comedy fan.